We provide quick response 24/7 on our emergency air conditioning services in Huntersville, NC, and our trucks are well-stocked, so your repair can often be taken care of on the very first visit. If you live in Huntersville, NC, you know that temperatures in July, August and September can easily reach nearly 100° with the near 100% humidity, making it feel even hotter. That is when you really count on your air conditioning equipment and also on those who provide prompt air conditioning services if you run into a problem. At Cool Comfort Heating & Air, we provide quick response 24/7 on our emergency air conditioning services, and our trucks are well-stocked, so your repair can often be taken care of on the very first visit. 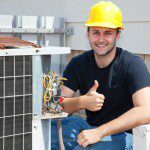 In addition to air conditioning services for those sudden breakdowns, we also offer preventative maintenance agreements to help you avoid those untimely breakdowns. We recommend having your system checked twice a year – just prior to summer and again before winter arrives. This enables us to take care of any issues before you turn your system on for the first time of the season. We also offer air conditioner replacement and air conditioner installation. Whether you need air conditioning services for new construction or to replace an aging and inefficient system, we can handle it for you. We will take the time to discuss your options, so you can select a system that fits your budget. We offer numerous financing options, as well, so you could be more comfortable and saving money on your utility costs in no time! Give us a call today to schedule a consultation, repair, or any of our other air conditioning services. By using a professional for air conditioner installation, you can be assured that the best model for your home is offered. Sometimes even new home construction with a contractor can result in the wrong size unit being installed. At Cool Comfort Heating & Air, we carry a variety of different air conditioner replacement options designed to fit any budget. We also provide financing options, so cost doesn’t become an issue.